First things first: I admit freely that the organ is not my preferred instrument to listen to or work with. However, the times I’ve heard a large pipe organ dominate a worship space, I’ve been significantly moved. But I’ve noticed a shift in my own heart taking place over the last several years and have been wondering what God is doing. I’ve had the pleasure of working with two very gifted organists over the course of the last few years within our own congregation, each passionate about the instrument and passionate about what worship looks like in the local congregation. While we have had our differences of opinions I’m thankful to say that being certain that I equip them to do what they love within the local church has given me a much greater appreciation for the organ, particularly its power and vast history within the church, as well as for both of our organists involved in the congregation. So, our services have been “blended” over the last few years, where one Sunday we’ll have mostly hymns driven by piano and organ and the next we’ll have mostly modern music driven by a modern worship band. Through some healthy discussion with one of our organists I’ve begun to wonder if this is the wrong approach. What if we blend each service, with both historic and modern elements separately as well as fused together within the same service? It turns out, as well, that I’m not the only one thinking about this and asking these questions. I knew of a couple of worship leaders that have a wonderful perspective on the “healthy tension” of rooted and relevant worship that Bob Kauflin has taught about and thought, “You know what, just for kicks, I’ll reach out to them on Twitter and see what happens.” Both of them were very interested, even to the point of wanting to talk about it soon. 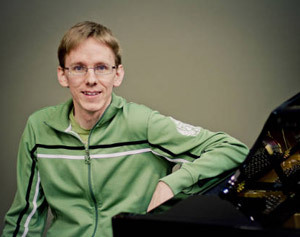 I’m looking forward to Skyping with both Jamie Brown and Zac Hicks this coming Thursday, as well as potentially talking to Chelsea Chen, the highly accomplished organist and artist in residence at Coral Ridge Presbyterian Church. 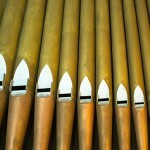 I knew that Jamie had merged pipe organ with modern music in the “A Thousand Amens” project. But I didn’t know that Zac had already spent a good amount of time thinking about this. Worshiping as a united body amidst a diversity of tastes and styles means that everyone has to die a little. You might be able to teach your child a much more profound Christian truth (than that “we must worship in our style) about self-sacrifice for the sake of the body. Imagine how impacted she would be by seeing THAT example! I think he hit the nail on the head where he says that “everyone has to die a little.” People on both sides of rooted and relevant worship can become quite stubborn and dig their heels, saying, “I don’t think this style is going to reach people” when what often they really mean is “I don’t like it.” What if modern musicians appreciated the majesty, complexity, and “other-worldly” feel of classical music and what if classically trained musicians begin to appreciate the simplicity and “nearness” of popular music? Can both sides “die a little” in order to accomplish a grander vision, one where both God’s majesty and authority as well as his nearness and love are displayed, side by side? To this point, Zac and Chelsea at Coral Ridge have begun to think about how to fuse the historic and majestic sound of the pipe organ with the culturally relevant sounds of modern pop/rock music. I love the opening track “Wake Up, Sleeper” from their recent EP “His Be The Victor’s Name” that starts with the authoritative and powerful sound of the organ and kicks the band into full gear just measures later. I love, even more, the fact that the chord progression the organ is playing at the beginning of the piece is a nod to Bach’s “Wauchet Auf” or “Sleeper’s Wake” or “Wake, Awake, for Night is Flying” as more people might know it (see more in the comments of the link above). Zac also blogged recently about what this merging of old and new might look like in the coming days and how the organ could make a big comeback in modern worship. There’s only one way that’s going to happen and I’m thrilled to potentially hear Chelsea’s take on it: humility. 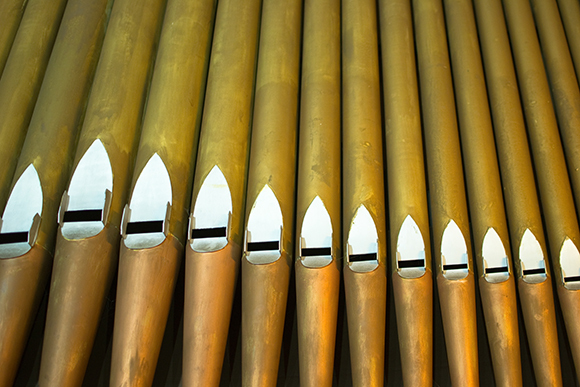 Classically trained organists have to be humble enough to view the organ as a supporting role within the larger group context at times, and modern musicians have to be humble enough to view the organ as a completely viable instrument. I’m really looking forward to our conversation on Thursday and even more looking forward to where this might go in the future, not only for our own congregation, but in evangelical worship as a whole.